Restoring your eyes to a more youthful appearance needs to address three concerns: volume, texture, and/or excess skin. In general, upper eyelids can be treated separately, while lower eyelids are often addressed as part of overall facial rejuvenation. 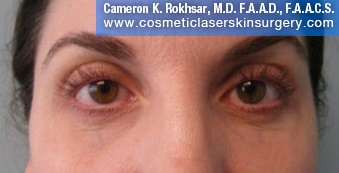 Skin excess: Removing lower eyelid skin is almost never required. In fact, removing the skin from your lower eyelid is likely to change the shape of your eye. Tucking your eyelid skin helps to both eliminate excess skin, as well as replacing lost eye volume. Using a laser, the surface of your skin excess is vaporized and then tucked. Texture: Just as a rubber band loses its elasticity over time, your skin becomes loose over time. 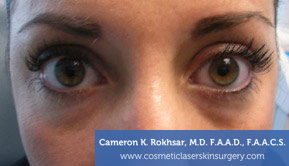 If you have little skin excess, or if your eyelid skin is “crêpe,” laser resurfacing can rejuvenate your skin. Resurfacing creates a controlled injury to your eyelid skin. As the injury heals, your skin becomes smoother. Although you will experience some redness, this can be camouflaged by makeup. 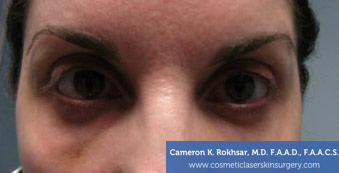 Volume: (See Eyelid Rejuvenation) Commonly, restoring volume is used for lower eyelid treatment. Lower eye area volume has a major impact on your overall appearance. Fat grafting is the most common technique for adding volume. Blepharoplasty for eye bag removal depends on the individual problem(s). 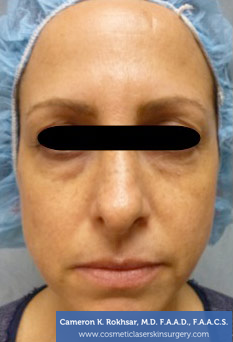 Blepharoplasty is often a blend of individual elements to address each component of what has caused the baggy eyelids. Sagging and droopy eyelids are usually associated with the natural aging process. Genetics, sun damage, adequate sleep, and hydration can also play a part in the appearance of your eyelids and surrounding eye tissue, but that doesn’t mean they have to stay that way. The skin of the eyelid and the skin above the eye are very thin and delicate, making it very easy to droop, sag and form wrinkles. There are three factors to consider when restoring the skin around the eye and that is volume, texture, and excess of skin. Blepharoplasty is a surgical method performed to remove the excess skin above lids. Small fat pouches can also be removed just below the eyes in order to reduce puffiness. 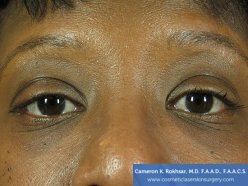 Blepharoplasty is specifically designed to improve the appearance of droopy eyelids as well as relieve heavy or tired-looking eyelids. 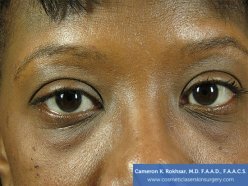 If there is swelling or puffiness around the eyes, Blepharoplasty can improve that appearance, proving patients with refreshing results. CO2 laser resurfacing is another route that patients often prefer to take and avoid a surgical procedure. 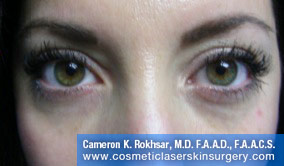 Dr. Rokhsar often uses laser skin resurfacing technologies to improve the appearance of patient eyes. The laser removes of a layer of skin as well as damaging deeper layers to stimulating new collagen production. The new skin will flourish, tighten and fill in the wrinkles and crevices above and below the eye. For those who are surgery averse, using Botox to lift the muscle at the end of their eyebrow can be an effective way to reduce a droopy appearance. 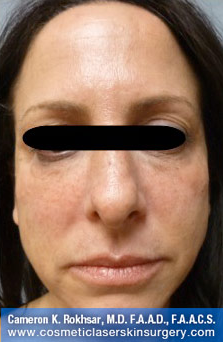 Dysport and Xeomin are also botulinum neurotoxin based injections that can lift the muscle and reduce saggy eyelid. For those that lose the natural fat that holds the eyelids up, using a filler injection can reduce this appearance as well. Tiny amounts of injectable fillers can prop the lids back up, the amount depends entirely on the patient’s cosmetic goals as well as the condition of their skin.